Well this looks rad as all get out..
Other than the length of the steep (I go for roughly two minutes) this is a nice recreation of my ritual at the office almost every day. I like the attitude of this guy. It's just coffee that's delicious. No need to wear tighter pants or to put wax in your mustache. VCR StreetSmarts #7: AeroPress from Verve Coffee Roasters on Vimeo. At Microsoft, as The Guardian has reported, the N.S.A. worked with company officials to get pre-encryption access to Microsoft’s most popular services, including Outlook e-mail, Skype Internet phone calls and chats, and SkyDrive, the company’s cloud storage service. And to think that I'd just recommended hosted Exchange. 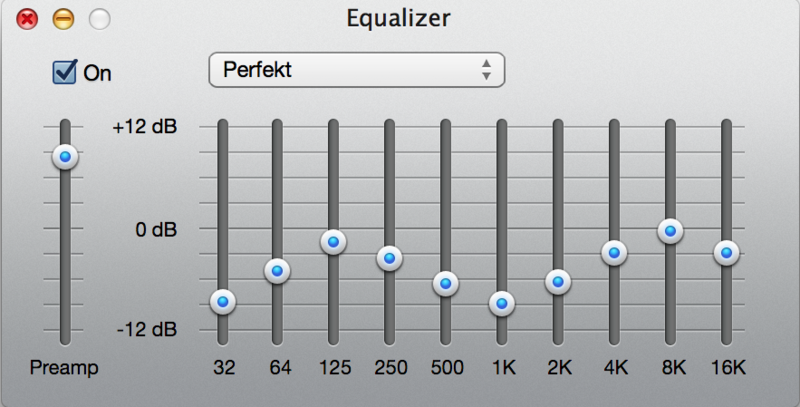 A modification to the EQ setting that's been on my computers for years. I added the Mac Pro to Match this morning and discovered that there was an edit early this year. Note the preamp level in particular. AC/DC Bag sounds great right now. To illustrate how the information was still at risk, he told editors that foreign agents could train a laser on “a plastic cup in the room where the work was being carried out … to pick up the vibrations of what was being said” there. Vibrations on windows could similarly be monitored remotely by laser. Following this logic, I guess I should just burn my house down. I feel like at some point this spring I unknowingly purchased a one way ticket to crazy town. About two years ago Tavis Rudd, developed a bad case of RSI caused by typing lots of code using Emacs. It was so severe that his hands went numb and he could no longer work. After trying all of the standard "conventional" solutions, such as different keyboard and generally paying attention to the ergonomics of his work station, nothing helped. As he puts it: "Desperate, I tried voice recognition". One more reason to use VIM. Black Hat is hacking scrubbed of its sense of wonder. And sadly, it mirrors the times we’re in. Violet Blue pens an incredibly insightful artcile about the contrast between DEFCON and Blackhat. As an outsider from what has become known as the "infosec industry" I feel this divide more and more each year. While it was nice to put some names to faces at some companies I use throughout the year on Wednesday night, I never felt at home. DEFCON is a conference that feels like a family reunion. Blackhat feels like a trade show. It should come as no surprise that the best conversations were had at the Caesars bar instead of the corporate parties. Next year I may find myself joining some neighbors over at the Alexis Park on Wednesday night. Best thing I've seen on the internet this morning. Makes me want to put on my shorty pants. ...and one of his socks. Do you think I'm especially not a genius? While not on the roster for Wednesday's hearing, another administration official in the spotlight is Director of Intelligence James Clapper, whom Democratic Sen. Ron Wyden has singled out for how he answered questions about the telephone surveillance program in March. In March, Wyden asked Clapper if the NSA collects "any type of data at all on millions or hundreds of millions of Americans?" On Saturday, Clapper told NBC News that he answered in the "most truthful or least most untruthful manner" possible. He told NBC that he had interpreted "collection" to mean actually examining the materials gathered by the NSA. He previously told the National Journal he had meant that "the NSA does not voyeuristically pore through U.S. citizens' e-mails," but he did not mention e-mails at the hearing. Emphasis mine. Interesting definition. Somebody notify EDRM and the Sedona Conference to let them know that they need to update their definitions. Q: What about the Obama administration's protests about hacking by China? A: "We hack everyone everywhere. We like to make a distinction between us and the others. But we are in almost every country in the world. We are not at war with these countries." This is turning out to be the most interesting story of the year. I think there's an important distinction to be made between Mr. Snowden and Bradley Manning. Snowden did this entirely on his own, released the information through an organization with credibility and had a plan. Thanks to an anonymous federal worker, we now know that DropBox should soon be a part of PRISM. Faced once again with the reality that you control your own privacy it's time for some better options. Along with SpiderOak, I'll be looking into running this out of my house. Excellent reporting this week from Glenn Greenwald. I know why you did it.. Some really cool stuff from my e-buddy Mike Mitchell. The new Daft Punk album is amazing. It's not what you were probably expecting and may take at least a couple listens before you really make your judgement. This article at Pitchfork gives a little insight into what they were going for and has some really killer visual design. Quote rejected from my upcoming forensics talk. Still awesome.